Bahia Honda (meaning deep bay, in Spanish, locally pronounced: BAY-ah HON-da [ˈbeɪə 'hɒndə], also pronounced (Spanish): Bah-EE-ah OWN-dah [ba'ia 'onda]) is an island in the lower Florida Keys. U.S. 1 (the Overseas Highway) crosses the key at approximately mile markers 36-38.5, between Ohio Key and Spanish Harbor Key 12 miles (19 km) west of Marathon, close to the west end of the Seven Mile Bridge. 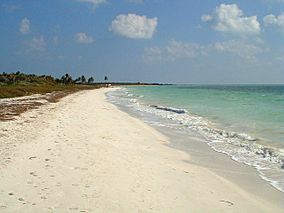 The island is virtually uninhabited, being home to the 524-acre (2.12 km2) Bahia Honda State Park. Founded in 1961, the park occupies most of the island. The channel at the island's west end is one of the deepest natural channels in the Florida Keys. The only known natural colony of the now rare Miami blue butterfly was discovered in the park in 1999. The butterfly had been thought to have become extinct as a result of Hurricane Andrew in 1992. Several rare plants, including yellow satinwood (Zanthoxylum flavum), Florida silver palm (Coccothrinax argentata), Key thatch palm (Leucothrinax morrisii), and the endangered small-flowered lily-thorn (Catesbaea parviflora) are found in the park. Henry Flagler's Florida East Coast Railway once ran through the present parkland to Key West. Built between 1905 and 1912, it was destroyed by the severe Labor Day Hurricane of 1935. Later, the railroad bridge foundations were used to build the Overseas Highway, which became U.S. 1. Part of the old Bahia Honda Bridge is accessible from the park, and offers a panoramic view of the islands. In 1908, the Florida East Coast Railway Company built two large two-story dormitories there to house workers building the Bahia Honda Bridge. In 1890 Bahia Honda Key was the southern terminus for Miami-Dade county which stretched as far north as present day St. Lucie River. The 2.5-mile (4.0 km) natural, white sand beach was rated the #1 beach in 1992 in the United States by "Dr. Beach" Stephen Leatherman (the first Florida beach to be so honored), making it popular for swimming. A nature trail near the park's oceanside beach skirts a tidal lagoon before passing through a coastal hardwood hammock. Bicycling and inline skating can be done on the park's 3.5-mile (5.6 km) paved road, and there are several fishing and picnicking spots in the area. The Sand and Sea Nature Center features displays about local sea and shore life, including corals, shells, crabs, sea urchins, drift seeds, sea sponges and sea turtles. Bahia Honda Key Facts for Kids. Kiddle Encyclopedia.